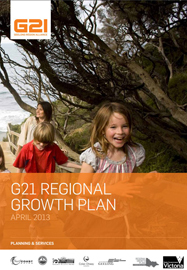 The G21 Regional Growth Plan covers the municipalities of City of Greater Geelong, Colac Otway Shire, Surf Coast Shire, Borough of Queenscliffe and the southern portion of Golden Plains Shire. The northern portion of Golden Plains Shire is part of the Central Highlands Regional Growth Plan. The plan provides broad direction for regional land use and development in the G21 region (Geelong). The G21 Regional Growth Plan has been endorsed by each of the five G21 – Geelong Region Alliance Councils and was launched by the Minister for Planning in April 2013.
the importance and role of other projects including other Regional Growth Plans, Plan Melbourne, G21 priority and pillar projects, as well as strategies such as the Corangamite Regional Catchment Strategy. The G21 Regional Growth Plan Implementation Plan was endorsed by the five G21 councils in December 2013.
analysis of the two further investigation areas identified in the growth plan for medium- to longer-term growth. The Implementation Plan is supported by a background report and a number of residential and industrial land supply reports. You can view or download a copy of the Implementation Plan and supporting documents by visiting the G21 Geelong Region Alliance website.